The primary objective for WNPA Syndication is to ease the sharing of news stories between several organizations. This plugin offers a central area for content from multiple external sources to be stored. Content is republished through a single feed that can be used to augment local news collections. External sources can be any standard RSS feed. At WNPA, these are the feeds of weekly newspapers throughout the state of Washington. 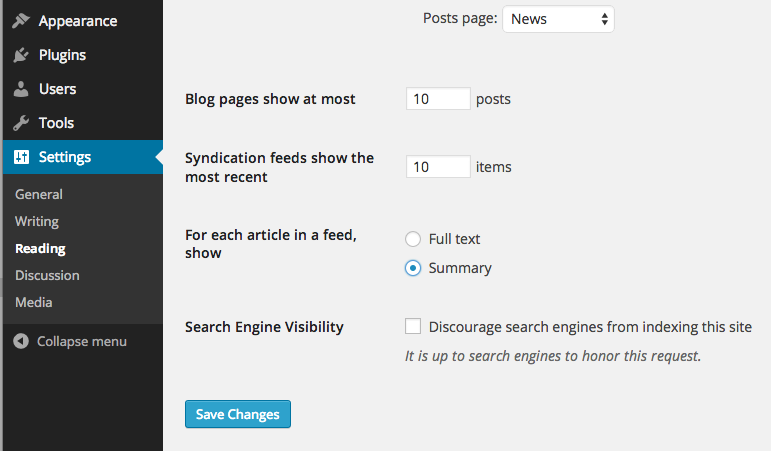 External sources are added and managed through the corresponding menu option in WordPress. Go to External Sources under Add New in the left menu of the admin area. This can also be accessed via New in the top toolbar. Save the source. Information indicating success or failure of item retrieval will be displayed. Click Save Draft if you would like to save the source without retrieving items yet. Click Publish or Update if the items from this source should be published. Once an external source is added, it will be processed on an hourly schedule for new feed items. While any standard RSS feed can be used, specific item elements in the feed can help categorize content and assign visibility. category Category elements with no specified domain will be used to assign general tags to feed items. category domain=”wnpalocation” Category elements with the wnpalocation domain assigned will be recognized under a location taxonomy. dc:accessRights (Default public) Can be set to either public or private in a feed to indicate the visibility of an item to the general public. dc:creator can be provided on each feed item to specify the author(s) of the article that should be highlighted in the byline. We will also fall back to the author tag from either the RSS specification or the Atom specification. These same item elements are provided in the RSS feeds produced by WNPA Syndication. Feed items are the individual articles pulled in through the external source RSS feed and can be accessed under the Feed Items menu in WordPress. Once items have been pulled in from external sources, they are immediately republished through a central feed. If the permalink option in General under Settings in the left menu of the admin area is set to anything other than Default, the URL of the feed will follow the structure of http://wnpa.wsu.edu/feed-items/feed/. If the permalink option is left at its default setting the URL will follow the structure of http://wnpa.wsu.edu/?post_type=wnpa_feed_item&feed=rss2. Only feed items that have a visibility of public will be shown in this central feed. To see items in a feed that have been marked as private, an access key is required. Access keys are used in combination with the central feed to gain access to items that have been marked as private. Each user has the ability to generate their own access key through their profile. Go to Your Profile under Users in the left menu of the admin area. Scroll to the bottom of your profile page. WNPA Access Information should be listed. Click Generate to populate the field for Access Key. Click Update Profile at the bottom. Copy the generated Feed URL that now has an appended access key. and The Edward R. Murrow College of Communication at Washington State University. Hosted by Washington State University on WordPress platform. Step Two: Larry will send a reply with a username and a temporary password. Step Four: Decide whether your news organization wants to send and receive stories automatically using RSS (Syndication) or manually. Step Five: For uploading and downloading stories automatically with synidication, have your technical support person click on the “Project Documentation” link in the left hand column and read ” Overview” as well as “Summary and Full Text Feeds.” Contact Larry if there are additional questions. If the newspaper prefers to upload and download stories without RSS, continue with these instructions. Step Six: Click “Editor Login” in the left hand column of wnpa.wsu.edu. Enter your username and password. If the login is successful, there will be a black bar at the top of the page. Step Seven: If necessary, create a permanent password. Your password may be changed by clicking on your name at the top of the page. Step Three: Type a headline in the top box. Step Six: Select site category in right hand column. Step. Seven: Select location in right hand column. If an external source’s feed is published through WordPress and normally available as summary text only, a plugin is needed to extend the feed so that two versions are available. Washington State University has created Dual RSS Feed Key for this purpose. In other words, a newspaper may continue to send summary information to individual subscribers via RSS, while sending the full story to his websiite. Once Dual RSS Feed Key is installed, an option is available to create a second, full text feed with the addition of a secret key. Create a secret key of your choosing and type it in the available input box. Once saved, a full text feed will be available for anyone given the address with this secret key. For example, if a WordPress site was at http://example.newspaper.com and had a summary RSS feed provided by WordPress at http://example.newspaper.com/feed/, and I add a secret key of my-secret-key-abc-123, a second RSS feed will now be available at http://example.newspaper.com/feed/?dual_rss_feed_key=my-secret-key-abc-123. Visitors to the newspaper site would continue to see summary text when subscribed to the feed. The secret key feed would be used to configure an external source on the WNPA site. To install Dual RSS Feed Key on your WordPress site, use Plugins inside your WordPress dashboard or go directly to the plugin page.